The Meeting Insights feature helps you to share files during a meeting with the meeting attendees. 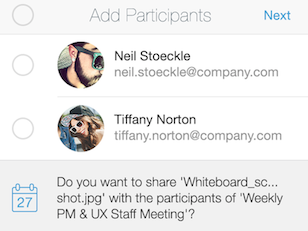 When you take a photo or create a document while in a meeting, a notification is triggered that prompts you to share the file with the attendees of the currently running meeting(s). If there is more than one meeting, select the meeting to see the list of attendees. If you choose to share the file with all or some of those attendees, the shared links interface is pre-populated with the email addresses of the meeting attendees. The file needs to be uploaded to Syncplicity before Meeting Insights is triggered. Meeting Insights is triggered 15 minutes before or after the meeting. This helps you to send files after the meeting ends or before it begins to all the attendees. The toast notification below is triggered for meeting Insights. 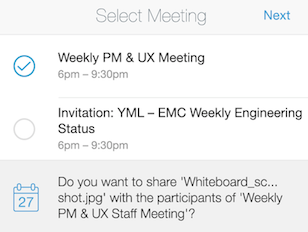 Tap this notification to get list of meetings from which you can select one. If there is only one meeting, the toast notification is not there. Once you select a meeting, you see the list of users as shown below. You select the attendees then tap Next. The shared link flow starts. You can send a shared link to the document uploaded in the meeting from there.